Typical car mats seem to only last a couple of years, and the winter takes the biggest toll on their appearance. The snow, ice, and salt discolor our car mats and can become an eye sore quickly in new cars. Consider installing WeatherTech floor liners for the winter, or better yet, keep them installed year round! Custom Fit: WeatherTech makes several products but the most popular for us and the ones that I have used myself are the custom fit floor liners. These mats are made out of a patented tri-extruded composition which allows for a rigid core for strength, and a tactile feel to the surface. Because these liners are digitally fit to your car’s interior, they fill your entire floor and curl up the edges of your car to keep dirt and mess contained. All Seasons Protection: WeatherTech floor liners are designed for all seasons. Dirt, mud, sand, rain, snow, ice, and rock salt are no match for these floor liners. They are channeled to carry fluids and debris away from your shoes, which is great in the snowy months to keep melting snow and ice away from your clothes! Long Lasting Results: As I mentioned, my WeatherTech floor liners have lasted 5 years and they still look as good as the day I installed them. They can be removed and cleaned easily with an a garden hose or degreaser as necessary. Made in the USA and backed by a 3 year warranty. Your may purchase just the front row, or liners for every row of the vehicle; they choice is yours! It’s easy to get your new WeatherTech floor mats… all we need to know is your car and model year. 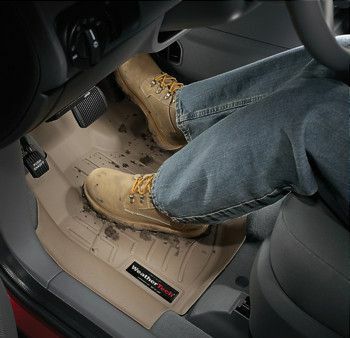 WeatherTech does the rest and, in as little as a week, you will have brand new floor mats! For more information on WeatherTech products, please visit the WeatherTech website or stop into our store and see our full display of all their products!